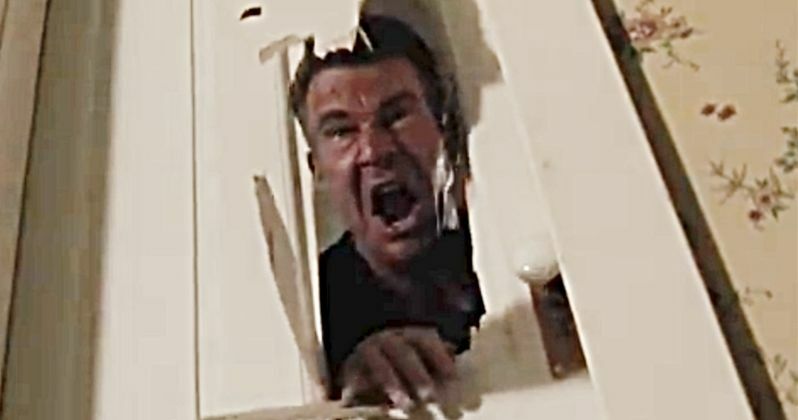 Dennis Quaid gets to show off his madman persona that we so seldom see. He's taking a page out of the Nicolas Cage play book, and turning things up to 11. We haven't seen him this on fire and wackadoo crazy since his spirited performance in, well, Great Balls of Fire, playing the iconic rocker Jerry Lee Lewis. Quaid plays Charlie, who is a little too attached to his old home. He cuts his old lawn whenever he feels like it, and he sneaks around at night, making some very loud creaking noises. We later learn that Charlie's wife died in that house. She put a shotgun in her mouth, and blew her brains all over the wall. At least, that's how good old Charlie explains it. But you can tell there is something more to this sinister story. Quaid comes unglued when he sees some home improvements going on around the property, becoming quite upset at some holes that are being drilled. Soon, he is stalking the young couple, hiding behind trees in their yard, and jumping from the staircase, yelling menacing one-liners like, 'Lights out!' As be blows apart the chandelier with what appears to be the same gun Mrs. Charlie used to end her miserable life. Before you know it, Charlie is busting through the bedroom door like Jack Nicolson in The Shining. It looks like a ton of fun, and it's actually scary. There are faint whiffs of Michael Keaton's Carter Hayes from Pacific Heights, which followed a tenant tormenting his married couple landlords. This one looks like it's going all the way with an absolute crazy performance from Dennis Quaid. Deon Taylor directs The Intruder from a screenplay by David Loughery. Taylor directed Meet the Blacks, which was sold as a spoof of The Purge, but turned out to be more of an authentic purge movie, going as far as to call the night of mischief The Purge, with some jokes sprinkled on top of it. There weren't a whole lot of sight gags, and it's obvious Taylor was looking to sink his teeth into something a bit more substantial. The folks over at Sony must have liked what they saw in The Intruder. Taylor has six more movies either in post-production or in pre-production. He's definitely a filmmaker to keep an eye on. If you like scary thrillers with bonkers neighbors and stalking weirdos, The Intruder definitely looks like it has us covered on all fronts. You can check out the trailer direct from Sony along with the poster.